Bahawalpur City, is located in southeastern Punjab province, Pakistan. Bahawalpur is 889 kms from Karachi. 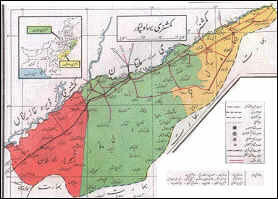 Saraiki is the local language of the area. Urdu, Punjabi and English are also spoken and understood by most of the people. 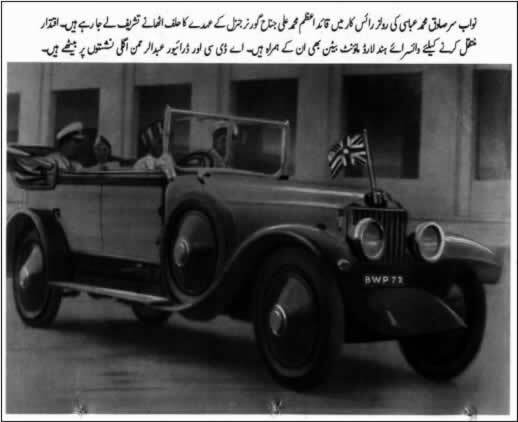 State of Bahawalpur was Nawab Bahawal Khan Abbasi I. The Abbasi family ruled over the State for more than 200 years (1748 to 1954). 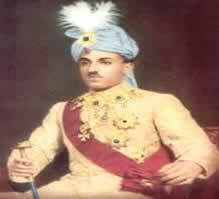 During the rule of the last Nawab Sir Sadiq Muhammad Khan Abbasi V, Bahawalpur State was merged with Pakistan. 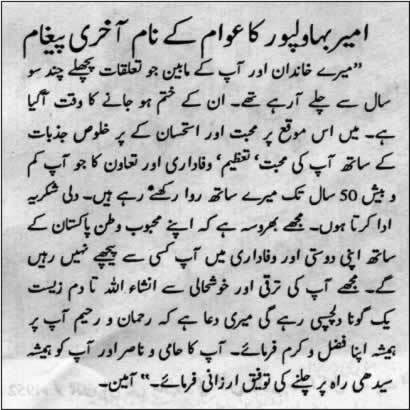 During the 1960's (1954) the Nawab agreed (Agreement Dated 3rd October, 1947) for Bahawalpur to be absorbed into modern Pakistan. He was however given special priveledges including the right to import several cars duty free each year. Bahawalpur was formerly the capital of the state and now is the District and Divisional Headquarters of Bahawalpur Division. 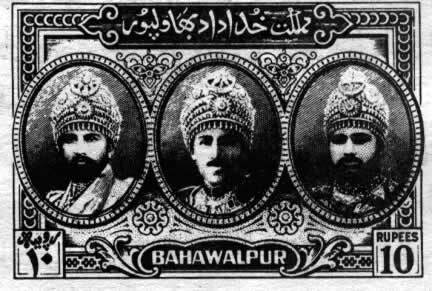 The Nawabs of Bahawalpur originally came from Sindh; they formed a princely state and assumed independence in 1802. The City, which lies just south of the Sutlej River, was founded in 1748 by Muhammad Bahawal Khan and was incorporated as a municipality in 1874. It is the site of the Adamwahan (Empress) Bridge, the only Railway Bridge over the Sutlej River in Pakistan, and has rail links with Peshawar and Karachi. The region surrounding Bahawalpur to the west, called the Sindh, is a fertile alluvial tract in the Sutlej River valley that is irrigated by floodwaters, planted with groves of date palms, and thickly populated. The chief crops are wheat, gram, cotton, sugarcane, and dates. Sheep and cattle are raised for export of wool and hides. East of Bahawalpur is the Pat, or Bar, a tract of land considerably higher than the adjoining valley. It is chiefly desert irrigated by the Sutlej inundation canals and yields crops of wheat, cotton, and sugarcane. Farther east, the Rohi, or Cholistan, is a barren desert tract, bounded on the north and west by the Hakra depression with mound ruins of old settlements along its high banks; it is still inhabited by nomads. The principal inhabitants of the region surrounding Bahawalpur are Jat and Baluchi peoples. There are many historical sites in the area, including Uch, southwest of Bahawalpur, an ancient town dating from Indo-Scythian (Yüeh-chih) settlement (c. 128 BC to AD 450). Pop. (1981) City, 180,263; (1981 prelim.) metropolitan area, 695,000. Bahawalpur is also an important agricultural training and educational center. Soapmaking and cotton ginning are important enterprises; cotton, silk, embroidery, carpets, and extraordinarily delicate pottery are produced. Factories producing cottonseed oil and cottonseed cake were built in the 1970s. It is an important marketing center for the surrounding areas and is located on the crossroads between Peshawar, Lahore, Quetta and Karachi. Bahawalpur is also known for its distinctly embroidered slippers and shoes and the filigree pottery which is made here. The City is located favorably for commerce, lying at the junction of trade routes from the east, south-east, and south. It is a center for trade in wheat, cotton, millet, and rice grown in the surrounding region. Dates and mangoes are also grown here. Canals supply water for irrigation. The principal industries are cotton ginning, rice and flour milling, and the handweaving of textiles. Sutlej (Chinese, Langqên Zangbo or Xiangquan He; Indian, Satlej), chief tributary of the Indus River. It rises in Tibet, flows south-west through Himachal Pradesh State, India, and then passes through the great arid plains of Punjab Province, Pakistan, joining the Indus after a course of about 1,450 km (900 mi.). The Sutlej is the south-easternmost of the five rivers of the Punjab, the other four being its two main tributaries, the Beâs and the Chenab, together with two branches of the latter. Below the confluence of the Beâs, the river is sometimes called the Ghara, and its lowest course, after receiving the Chenab, is called the Panjnad ("five rivers").